Up until a week ago, the crazy idea that a company would beam internet service around the entire planet from the sky was just that: a crazy idea. Then, in the span of a few days, we've heard details from not one but three tech behemoths that want to do just that. This fantasy is becoming a reality, and fast. The latest development, perhaps unsurprisingly, involves Google. The search giant just finalised a $US1 billion investment into Elon Musk's as-yet-unnamed space internet project at SpaceX. This news arrived just a few days after the PayPal founder divulged details of the long-rumoured project to the press. And that news emerged just a few days after we learned that Richard Branson's Virgin Group and Qualcomm would be investing in OneWeb, a similar space internet project from Musk's old buddy Greg Wyler. Why is everybody so suddenly interested in building a space internet? Well, there's a lot of money to be made, for one. It's also perhaps the only way to give everybody on Earth internet access without building an untenable amount of infrastructure. The interest is not so sudden, however. America's been dreaming about it years. 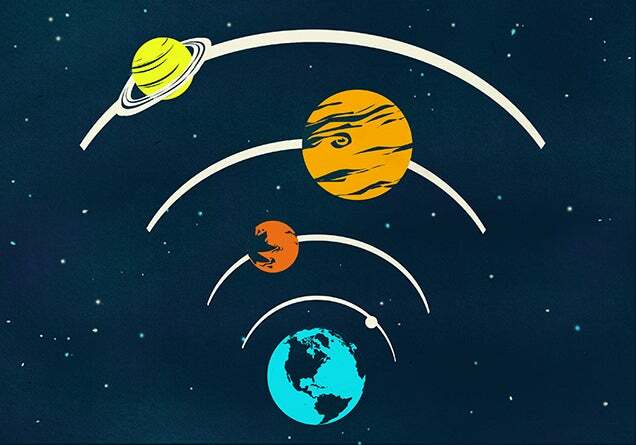 Before digging into the latest news, it's important to distinguish the difference between what many people are calling "space internet" today and the historic idea of having internet in space. The former usually refers to a satellite-based internet service intended to be used on Earth's surface. Private companies have been pursuing this project at least since the 1990s, and it's what we're focusing on today. The idea of having internet that can be used in space, meanwhile, goes back further, and is sometimes referred to as the interplanetary internet or IPN. (You might also hear people call it InterPlaNet or the outer space internet.) This idea is much more ambitious and tends to involve the folks at NASA. Without going into too much detail, building an Interplanetary Internet would enable us to communicate with other planets with the same ease and reliability that we communicate with each other on Earth. Well, that's being a bit generous. Due to the simple constraints of distance and the speed of light, communications between planets would be delayed by several seconds or minutes. So IMing with someone on Mars might be a little bit frustrating. After several decades, once there's enough hardware spinning around the solar system, IPN promises near-continuous communications from space, driving costs down and increasing bandwidth (an even more precious commodity outside Earth's orbit). Later on, Cerf envisions this interplanetary backbone plugging into our own terrestrial Net. Students might log on to watch a webcam-equipped rover tour the Martian landscape. Astronauts could send and receive email and download music or movies. Based on Cerf's predictions — many of which have already come true, by the way — you can start to see how a space internet and the interplanetary internet will one day work together. NASA's currently testing out a system that involves zapping lasers across the solar system to strengthen that interplanetary internet backbone. Meanwhile on Earth, several billionaires are working hard on a slightly more terrestrial infrastructure. The ambition to bring connectivity to the entire planet via satellites (or other flying objects) obviously isn't a new one, but a lot of very smart people have gotten very serious about creating a space-borne internet provider in the past decade and a half. Unsurprisingly, the race started with the dot com boom of the late 90s. Early efforts to build a space internet failed almost immediately. Two of the biggest early contenders, Iridium Communications and Globalstar, launched satellite-based communication networks in tandem at the end of 1998. Iridium filed for bankruptcy nine months later. Globalstar lasted a bit longer but went bankrupt in early 2002. Both companies ended up building viable satellite telephone businesses, while other companies like SkyBridge and Teledesic also failed at their own attempts to build a space internet. The dream seemed rather impossible without someone with deep enough pockets for the massive upfront investment in satellites coming along. 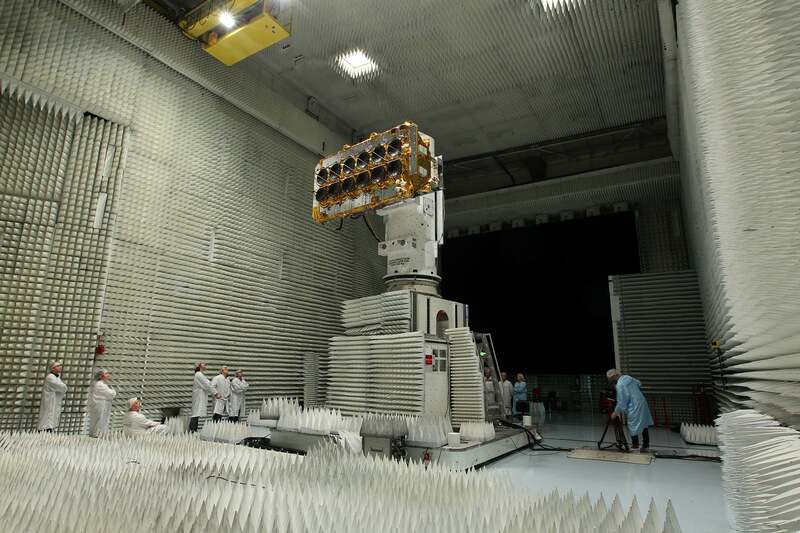 And even after the upfront costs, after the satellites are aloft, there's still an enormous amount of expense involved in keeping the thing running. The ambition far outpaced the means. In 2007, however, entrepreneur Greg Wyler started a next-generation network company called O3b to bring cheap, reliable internet to the entire globe with medium Earth orbit satellites. (O3b stands for "the other 3 billion".) The New York Times reported in 2008 that "buying backhaul capacity from geosatellites can cost a stunning $US4000 per megabit per month." Wyler's plan was to offer the same capacity for $US500 or less. It was an ambitious goal, ambitious enough to attract attention from Google and other investors. Although O3b initially planned to launch its first satellites by 2010, the company finally managed to get the first four into orbit in 2013 and the other four in 2014. The hardware was plagued with problems, but the network eventually supported speeds as high as 2.1 Mbps. As a point of comparison, the average global broadband download speed is 21.9 Mbps. Wyler didn't stick around, though. He left O3b, the company he founded, to work on Google's own internal space internet project in 2014 and took a couple friends with him. Not long thereafter, all three of them left Google to join WorldVu Satellites, an ambitious project that aimed to put some 700 satellites into orbit. At the time, Wyler was reportedly spending a lot of time at the SpaceX offices, as Elon Musk was especially interested in this satellite-based internet idea. WorldVu — later renamed as OneWeb — only had about 30 employees then, but it had something very special: access to the satellite spectrum once owned by SkyBridge. If this all sounds very complicated, that's because it is. The first decade or so of the 21st-century was the Wild West of satellite-based internet. Everything became a lot simpler at the beginning of this year, thanks to Musk's announcement about SpaceX's new intitiative and Branson's investment in OneWeb. A Google-funded SpaceX versus a Virgin-funded OneWeb amounts to a clear battle for the future of space internet. But then there are a few more ambitious billionaires to consider. While Wyler was busy figuring out how to build satellites as cheaply as possible, Google X was working on a loony plan of its own. Google's hyper-secretive R&D lab wants to fill the skies with high-altitude balloons that beam internet down onto Earth's surface. The company calls it Project Loon (of course). Project Loon is not quite space internet, but it's close. It actually sounds crazier than it is. Google's already conducted several trials of its balloons, which broadcast signals as far as 20km. In a sense, the balloons do the same work that satellites would, only with less range. While medium Earth orbit satellites fly between about 1900km and 36,000km above Earth's surface, Google's internet-beaming balloons fly at an altitude of about 18,000m, using the power of the wind to keep them aloft. That means that they will need thousands of balloons instead of hundreds of satellites. It also means that UFO sightings are through the roof. Project Loon isn't perfect. Google claims that the balloons can "beam internet access to the ground at speeds similar to today's 3G networks or faster." However, the idea that thousands of untethered balloons will float around the planet is more than a little bit absurd, even though they fly at altitudes higher than planes. The balloons can still burst and send balloon shrapnel down to Earth's surface. Plus, 3G networks aren't that fast when you compare it to the fibre-like speeds promised by internet-beaming satellites. To boot, the balloons can only stay in the air for about 100 days at a time. Mark Zuckerberg has a better idea: drones. Facebook's Connectivity Lab has been working a batshit crazy plan "to build drones, satellites, and lasers to deliver the internet to everyone". The mission falls right in line with the social network's Change.org initiative to bring internet connectivity to everybody on the planet. It's also probably obvious at this point that internet companies like Google and Facebook stand to benefit greatly from bring another three or four billion people (read: customers) online. Crazy as it sounds, the Facebook drone plan actually makes more sense than Google's silly balloon plan. Around the time that Zuckerberg first announced the drone internet initiative, Facebook announced plans to purchase Titan Aerospace, the makers of the world's longest-flying drones, for $US60 million. These 16m long solar-powered aircraft can stay in the air for up to five years, circling the globe for whatever mission you program them to do. That kind of range means that a single drone can cover an area as big as 16,000 square kilometres which amounts to the same reach as over 100 terrestrial cell phone towers. But then guess what? Google bought Titan Aerospace just a couple months after Zuckerberg's head-turning announcement. Apparently, the search giant is planning to use the drones for Google Earth-related projects, namely the ability to do live mapping of Earth's surface with streaming data. 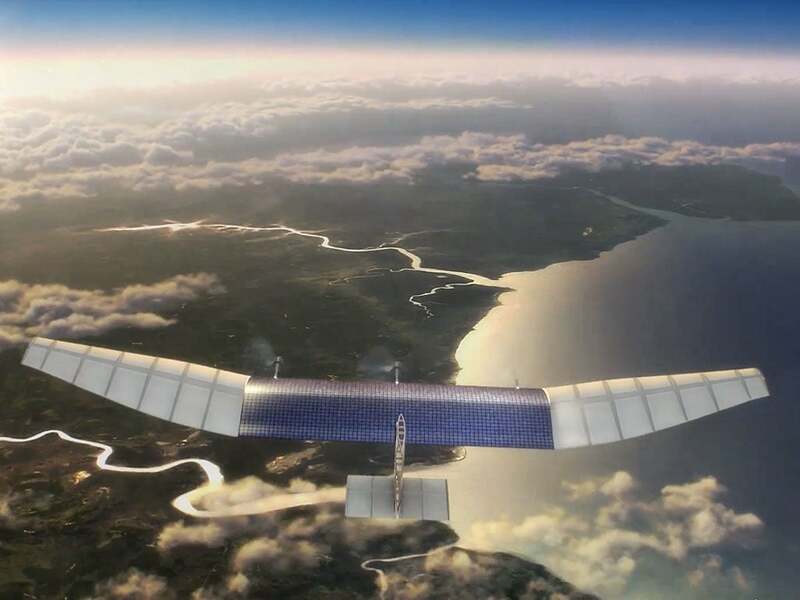 Facebook still wants to build its drone-powered internet despite the setback. So a lot has happened in the space internet race over the course of the past year. But the past week in the news has been game-changing̦. Google's reported investment in SpaceX's internet project and the Virgin Group's investment in OneWeb have made Elon Musk and Richard Branson our space internet frontrunners. Both SpaceX and OneWeb have proven that they can raise money and send things to space. 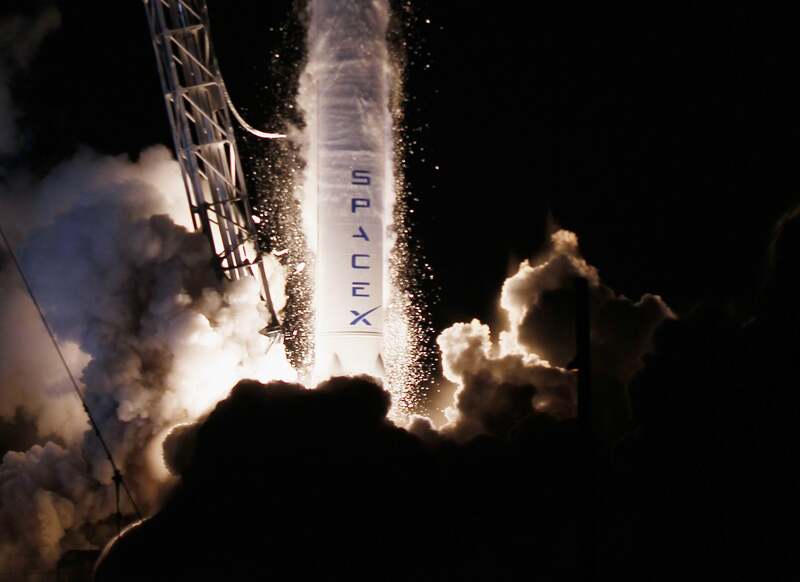 SpaceX has recently shown prowess in transmitting large amounts of data around the planet. A few months ago, the company blasted a Falcon 9 into orbit that was equipped with CASSIOPE, the Canadian space agency's super-fast, space-borne file transfer system. This new express delivery service for large amounts of data sits in low-orbit — just like Musk's space internet satellites will — and circle the globe every 90 minutes. The system works by picking up tens of gigabytes at the source, circling around to the destination, and dropping off the data. Like so, CASSIOPE is capable of sending data at a blistering 2100 Mbps. It's unclear what SpaceX will draw from technology like CASSIOPE. Musk is correct to claim that space internet can be faster than terrestrial internet, however. "The speed of light is 40 per cent faster in the vacuum of space than it is for fibre," Musk told Bloomberg Businessweek recently. "The long-term potential is to be the primary means of long-distance Internet traffic and to serve people in sparsely populated areas." PS. Musk also wants to provide Mars with its own space internet so that he can read Twitter when he retires there. Meanwhile, OneWeb arguably has more experience in the space internet business than anyone. And the company owns the spectrum needed to operate a network in orbit. Richard Branson, for one, thinks this is what really matters. "I don't think Elon can do a competing thing," Branson says. "Greg has the rights, and there isn't space for another network — like there physically is not enough space. If Elon wants to get into this area, the logical thing for him would be to tie up with us, and if I were a betting man, I would say the chances of us working together rather than separately would be much higher." So will the great space internet race be a three-legged-one? It's unclear. With the expected initial investment clocking in around $US10 billion, it would even make sense for the billionaires to take some sort of Voltron approach. Imagine if Musk, Branson, Zuckerberg, Brin and Page all joined together to create the future of internet infrastructure on Earth and beyond. Imagine if five filthy rich white men controlled how we all communicate. Imagine. For the Facebook and Google crew, the incentive is simple. Space internet means more customers but not necessarily more profit. That makes Branson and Musk's recent investment in the Herculean task of sending hundreds of satellites into orbit a bit more capitalistic. If either OneWeb or SpaceX manages to build a space internet, those two billionaires stand to profit directly from selling internet service to the entire planet. (Let's not forget that Google is in the ISP business now too.) Meanwhile, Musk gets more money to fund his bonkers plan to build a city on Mars. Regardless of who wins the space internet race, billions of people stand to benefit. And quite frankly, some sort of partnership makes great sense. Let's only hope that we do it right. Because if we've learned anything about how the terrestrial internet works, it's the simple fact that people do not like it when only one company controls it.